With that, there’s no doubt the popular social media platform gives you, an entrepreneur, the opportunity to reach thousands of your ideal customers located within your community fairly quickly. So, how does one break through all that noise—from a sea of posts from family and friends, and even ads—to build awareness, provide more product or service information, and, ultimately, blow through sales goals? By knowing the five simple hacks to crush Facebook ad writing. Let’s refresh your memory on a few checklist items you need to have marked off before you jump right into the writing process for that Facebook ad of yours. (By the way, these were pulled from Facebook.com, so you know they must be 100% critical to getting the results you’re hoping for). ✔ Know the goal. What is the purpose of your ad? Do you want to push out a new product or service to your audience? Drive more foot traffic to your store(s)? Encourage more website views? Whatever it is, identifying the business goal you’re hoping to accomplish before all else will help you build a Facebook ad that has the greatest opportunity to achieve your desired results. ✔ Know the audience. Who do you want to target with your ad? Hone in on the ideal gender, age range, interests, and all that good stuff before you dive into the creative—design and copy. That way, you’ll have a better idea of the design components and words to use to appeal to your intended readers. Plus, you’ll ensure your actual ad targeting is on point when it comes time to select the audience. *Learn more about ad targeting here. ✔ Know the topic. This is where completing the first two checklist items will come in handy. Think about your audience and what would be the most compelling offer for them to receive—something so good (and relevant) they just couldn’t pass up. Is it a new product or service to bring back old customers? An exclusive deal for those who present the coupon in the store? Knowing the subject or theme of your ad will help you tackle everything else that follows in composing a champion campaign. *We’ve pulled some great tidbits from our friends/Facebook ad experts at Closer’s Cafe to deliver top-notch insight on each of the following hacks. What I mean by that is, keep it simple and resist the urge to tell the full story of your offer in the ad itself. I know, I know. It’s tough stuff, especially when you’re going to be dishing out some of your hard-earned money to successfully communicate all that you can (and want to). Ultimately, however, you just need to offer up enough compelling information that’ll get that much-wanted click. And, from there, you can say and do all you want and need to in order to sell that product or service of yours. Create a short, snappy headline that speaks to your ideal customer (aka the target audience for your ad)—consider it the teaser to getting them to take action. Call attention to the key benefits of your product or service in the text area of your ad—how will it help your ideal customer alleviate their biggest headache? What will they get out of grabbing hold of your offer? Staying focused on these essentials will, without a doubt, make it easier for you to get your point across in a clear, concise manner. All while keeping the value that you have to bring to the table front and center. Sometimes, going matchy-matchy isn’t always what’ll get you the attention you want and deserve—especially if we’re talking about business attire. Too much of one color or pattern and you’ll be riding the train of regret, wishing you’d taken a different route. As for Facebook ads, however, going matchy-matchy is the only route you should take. But, exactly how far should one go? Well, just be sure the creative elements of your advertisement match your messaging. Yet, as you jump the gun at the sight of the dog and prematurely click, you realize the ad is actually for cat adoptions. Oh no. That’s not what you expected. So, what harm could a funny or cute image do to take your message to the next level? The truth is, it can do a lot of harm. That said, don’t relinquish aligning your message with your creative elements—from your image to the page your ad takes clickers to (whether it be an opt-in, homepage, etc. ), and more. Some advertisers let their visuals do the talking as their copy goes completely lifeless sitting on the ad. But, when you punch in a few powerful words—ones that leap off the screen—you’ll help your ad score big across News Feeds while competing with people’s friends and families. To make it easy on you, we’ve published our favorite list of 9 persuasive words that will stick. Choose a few below and you can look forward to catching the attention of your audience in no time. The best ads give readers a polite nudge with a hint of FOMO—fear of missing out. Reason being, no one wants to be left out of the “cool kids” crowd and lose out on a great deal. Therefore, make your audience think everyone else is already using your product or service and they’re the “last” ones to join the club. Just take a look at BarkBox’s Facebook ad. At first glance, you know there’s only one day left to grab hold of the offer—a premium toy added to a 6- or 12-month subscription for your furry friend (up to a $150 value). If you were the target of this ad, I’m sure you wouldn’t want to miss out on that deal would you? Heck no! Why? Because a hyper-specific call to action decreases friction. Once your audience clicks on your ad, they’ll know exactly what to do next, performing the desired action upon arriving at the destination—a landing page, shop page; you name it. Following in the brand’s footsteps, be sure to use a specific action verb (get, do, try, start, find, learn). A single call-to-action that’s well written, and supports your creative and overall offer, will leave your audience with only one choice to make—to click that button. Maybe you feel your ad’s headline was straightforward while still being witty enough to garner attention, but your audience didn’t seem to agree. There’s no time to get your feelings hurt. Instead, A/B test your Facebook ad’s headlines. After all, it’s the most important part of your ad. Word to the wise—not every writing tip is 100% bulletproof when it comes to Facebook’s constant flurry of updates and changes, affecting business owners like you. 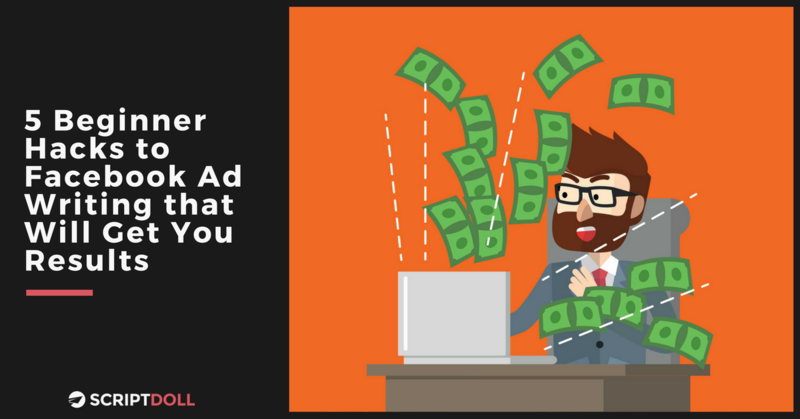 Nevertheless, go ahead and jump on the social advertising bandwagon and grab hold of these hacks to test out what works for you. Navigating the murky Facebook waters can be challenging, however. So, if you’re looking for a way to make more money using Facebook ads once you craft winning copy, be sure to get your FREE copy of the One Easy Strategy That Will Make You More Money with Facebook Ads, delivered straight to your inbox. All you need to do is input your email in the box to the right of this page. We want to know: have you written Facebook ads for your business? Share any tips we might’ve left out in the comments section below.